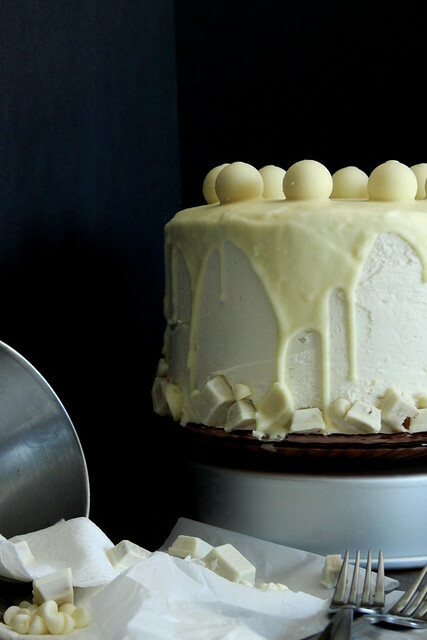 How did white chocolate candy cake come about? Well, sometimes the stars align and point out a very good course of action. For months I had accrued various white chocolate novelties: white chocolate peanut butter this, and white chocolate truffles that…Don’t even remind me about the 4 + bags of white chocolate chips I had from the holidays. Cosmic advice seldom occurs, but here with all of this white chocolate, the message was loud and clear: BAKE. 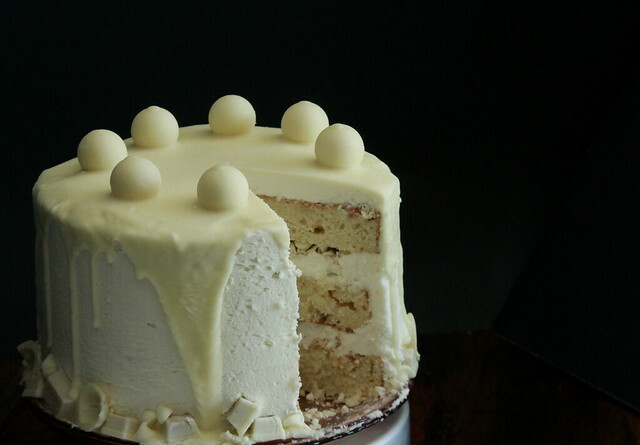 Bake a white chocolate candy cake. I am not one of those people whose willpower melts in the presence of chocolate. Maybe working at a chocolate place hardened me. Like candy, the smell of chocolate gets to you. Straight up chocolate loses it’s appeal. Give me chocolate and I melt it down for a ganache or chop it up and fold it into a brownie batter. I’ll take white chocolate over dark chocolate in an instant. Yes, yes, yes white chocolate isn’t really “chocolate” and does not have cocoa solids and has, at most, 20% cocoa butter. It is still wonderful in my mind. If you’re interested in knowing more specifics David Lebovitz posted (way back in the internet days of 2006) a good breakdown of white chocolate. I used Life, Love and Sugar’s white chocolate cake and frosting recipe as the pivotal base for all of my white chocolate loot. It is a lovely sour cream based cake that’s a good staple to have in your recipe box. 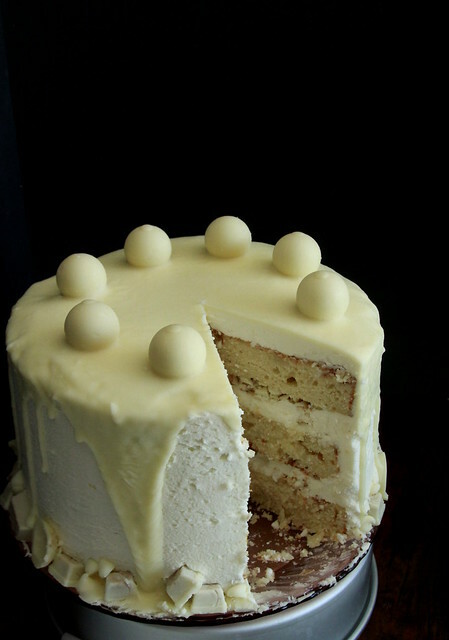 I opted to fold white chocolate chips into the batter and it turned the cake from a white cake to a white chocolate cake without being too sweet. To complete the white chocolate streak in this white chocolate Cake, I poured a simple white chocolate ganache over the op. 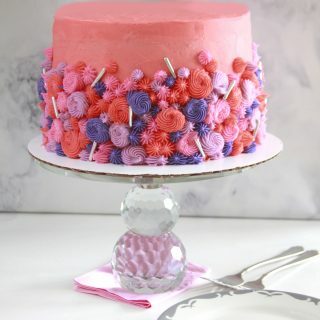 The subtle textural variations on the cake made for a visually interesting end product. You’ll get a good, not overwhelming white chocolate fix. Preheat oven to 350 degrees. Spray three 8-inch cake pans with baking spray. In the bowl of a stand mixer add the flour, sugar, baking powder, and salt. Fit the mixer with a paddle attachment and mix the ingredients on the lowest setting, about 30 seconds. Add butter, a few tablespoons at a time, until the mixer becomes crumbled pieces. Beat in the eggs, one at a time, until incorporated. Scrape down the sides of bottom of the bowl. Beat in the vanilla extract, sour cream and buttermilk and mix on medium speed just until smooth. Do not over mix. Fold in stir in white chocolate chips. Spread batter evenly between the three cake pan. Bake 35-40 minutes, until a toothpick inserted comes out with a few crumbs. Allow to cool for about 10 minutes, then remove to cooling rack to finish cooling. Sift together the powdered sugar and salt in a bowl, set aside. Place white chocolate chips in a metal bowl. Microwave heavy cream until it starts to boil. Remove from microwave and pour over chocolate chips. Cover bowl with saran wrap for 5-7 minutes. Allow ganache to sit until mostly cool. It should be thick. Beat the ganache with a mixer for about 2-3 minutes, until smooth and fluffy. Add butter and beat until it is fully combined. Slowly add powdered sugar and beat until it is fluffy and the right consistency. Add more cream if needed. 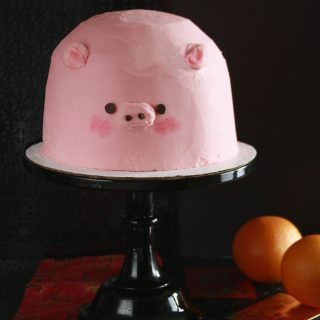 Level off the cakes so each layer is flat. 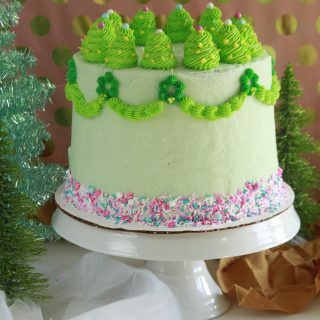 Frost each layer and stack the next layer on top. Carefully pour ganache onto the top of the cake. Let it naturally fall to the sides or gently glide it evenly with an off set spatula. 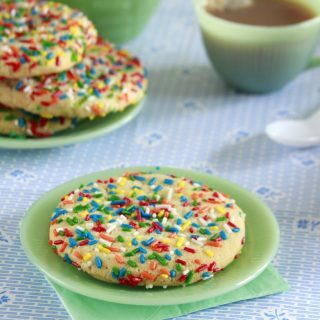 Decorate with white chocolate candies of your choice.